A military exercise code-named "Vanguard-2008" that partly opened to foreign students studying at China's military academies concluded in the central Henan Province on Tuesday, winning applause from the foreign observers. The week-long exercise was performed by a 2,200-strong armored brigade from the People's Liberation Army (PLA) Jinan Military Area Command, whose armaments are said to be among the best in the PLA land forces. 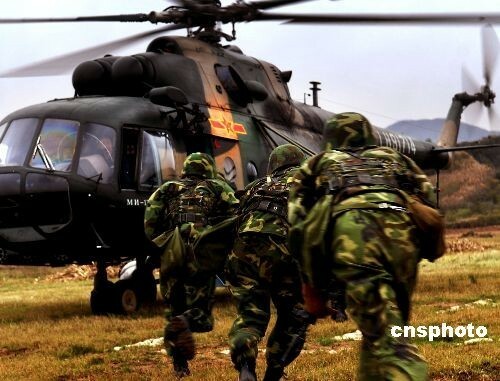 Armed with equipment including armored cars, armed helicopters and transport helicopters, the brigade fought fictitious "Blue Army" targets on a mountainous island with live ammunition. The brigade fired at nearly 70 targets with more than 7,000 rounds of various ammunitions during the exercise, according to brigade commander Zhang Jianfeng. "We can see from the military exercise the commanders not only have the idea of a plan, but also they can implement the designs, "said Frouarl Loic Roger Horst, a French colonel who studies at China's University of National Defense. "China is an important force for peace-keeping in the world. The exercise shows that we can cooperate more. We can deploy more people on the peace-keeping operation together," he added. Army Major Siew Ha Chean from Malaysia, the only female in the 179-member foreign student group, said she was impressed by the use of combined armies of different services during the exercise, "that is the something very new to me because it's my first time to see it on the spot." Maj Zahid Hamid Kiani, group captain of Pakistani air force, said with the exercise partly open to foreigners, China has sent a signal of peace-loving to the rest of the world. The 179 foreigners, from 67 countries, are mostly first year students at the Beijing-based University of National Defense and the Nanjing Army Command College in eastern Jiangsu Province. It is the largest group of foreign military students to observe a military exercise of the Chinese People's Liberation Army. The annual drill is divided into four stages -- change of combat readiness, long-distance maneuvers, strategy planning, and combat. It is designed to test the capacity of the brigade on carrying out joint action with different arms of services in mountainous areas.